Louise Jopling (1843-1933) was born in Manchester. She studied art in Paris under Charles Chaplin from 1867-68. She went on to develop a lengthy professional career as an artist, and painted portraits, figure compositions, interiors, landscape and genre scenes. She became a leading female artist in Victorian London who inhabited the most advanced artistic circles of her time. From the late 1860s, she exhibited at the Royal Academy and the Paris Salon. Major patrons included the de Rothschild banking family as well as aristocratic families such as Sir Coutts and Lady Lindsay, founders of the Grosvenor Gallery. The actresses Ellen Terry and Lillie Langtry posed for portraits. Jopling herself was much photographed - in the studio, teaching students at her art school and as a fashionable woman about town. Her confidantes included James McNeill Whistler and John Everett Millais, both of whom painted major portraits of her. Jopling was a versatile artist of wide artistic, literary and social interests. Together with other women artists such as Elizabeth Thompson Butler, she exhibited her work alongside male professional artists to considerable critical acclaim and was one of the first women to be admitted to the Royal Society of British Artists in 1901. Despite the many boundaries facing professional women artists, Jopling managed to lead a remarkably independent life, achieving a status beyond the genteel amateurism with which artistic women were all too often associated. For Jopling to define what it meant to be a professional woman artist was a recurring urge throughout her life and artistic career. This stemmed from her own attempts to establish a career and belief, notably in her essay 'On the Education of the Artistic Faculty' (1903), that women should be educated on equal terms with men. Born at a time when the notion of women in professional positions was the subject of increasing debate, Jopling achieved popular and critical acclaim. 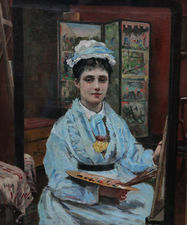 Whilst increasing numbers of women artists enjoyed some form of exhibition career, Jopling joined an elite group of female artists, including Elizabeth Thompson Butler and Rosa Bonheur, who achieved remarkable public success at mainstream art institutions and whose activities were followed closely in newspapers and magazines. At the same time Jopling spoke the 'male' language of professional art practice with an awareness that her gender set her apart. 'I hate being a woman,' she wrote, 'Women never do anything.' She recorded her experiences and frustrations in a candid memoir, Twenty Years of My Life, 1867-1887, published in 1925. Patricia de Montfort, Louise Jopling: A Biographical and Cultural Study of the Modern Woman Artist in Victorian Britain, published by Routledge-Ashgate.